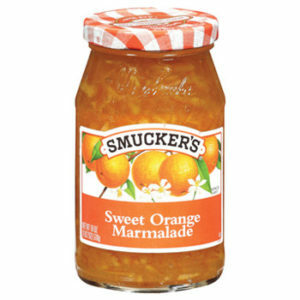 Smucker’s® Orange Marmalade delivers a sweet citrus-packed flavor that enhances dishes from breakfast to dinner. Spread on a hot buttered biscuit for the perfect start to your morning. Or, use to make a tangy glaze for chicken or pork. High Fructose Corn Syrup, Corn Syrup, Orange Peel, Orange Juice, Fruit Pectin, Citric Acid, Natural Orange Flavor.